Setting a new standard for café quality in New Westminster, Quantum Deli and Bistro brings a little slice of Yaletown to our Downtown area (cat-sized dogs not included). Quantum offers a killer cup of coffee, gorgeous decor, free wifi and a touch of the exotic with its homey paninis and soups. Look for unusual fare like za’atar alongside the egg salad sandwiches, and ma’amoul (date-stuffed sugarless cookies … oh so yummy) next to the shortbread. Every table is set with a small, modern arrangement from Queen’s Park Florist. The menus are displayed on digital screens. Quantum is probably one of the only New Westminster eateries to be written up in an interior design magazine (Or so the owner mentioned last time we were in. I didn’t catch the name of the publication, unfortunately). I maintain that ordering decaf is the best way to tell if a restaurant’s coffee is up to snuff. Decaffeinated coffee is almost always terrible, and only quality beans make it worth drinking. Quantum serves 49th Parallel coffee, which my coffee snob friends tell me is the good stuff (not like my taste buds couldn’t tell). Quantum also sells sliced deli meats, cheese, olives, roasted red peppers and dolmades at or below grocery store prices. They carry sandwich cheese favourites like Havarti and Edam, but there were also some I’d never heard of before. After sampling a few cheeses, we walked away with some mellow Kashkaval and salty Nabelsi. It’s worth noting that Quantum also provides meat & cheese party platters, also at grocery store prices (while offering far better quality food). All in all, I’m very impressed, and I plan to be back. Quantum Deli & Bistro is at 41 Sixth St. Next time you’re in the area, instead of waiting in line at the Starbucks on Columbia, duck around the corner and give Quantum a try instead. This is now first on my list of things to try – thanks for writing this place up. Congratulation's on such a great review Quantum! Completely deserved so much work went into this restuarant. Hakim and Katrina bring personality to downtown New Westminsiter, and the decor is impressive. Well this does not surprise me in the least to see how well received Quantum Bistro is. With the attention to detail and quality that both Hakim and Krystyna bring to everything they do, nothing but the best would be acceptable. The strong duo have not only superior design sense, a taste for fine foods, but they know how to act as welcoming hosts to all who have the opportunity to be their guests. We are very proud of the great space they have created for all to enjoy. All the best to you! Looking forward to our next visit in for a cup of your delicious chai latte and some tastie treats. Great to see. When I pass through the area, I'll make a point of stopping by. Any place with good coffee gets my attention. So I wanted a coffee and I made point to go into Quantum. I can say, they got it right. The space is just the right size and with just the right amount of seating. But now about the important stuff, food and drink. The food menu looked interesting and worth a return visit. My guess the place has been influenced by a Montreal style deli. I’m a big sandwich fan and when the staff is prepping ingredients in house in gives my a warm feeling. I only tried the coffee because that’s my thing but the shop is a great addition to New West. I've been into Quantum twice now, and while impressed the first time (coffee, from 49th Parallel, was great! ), the second time I had a chance to chat with the owners, Hakim & Krystina. I wanted to know why they made such huge efforts in the design and the materials, and what their focus was on creating this place. In a word? Quality of the experience. You want good coffee? Find better in the lower mainland. The decor is amazing, the kitchen gleams, the charcuterie display is wonderful; like nothing you have ever seen in a coffee place. Their menus are all posted on large video screens! When they need to update, it's a trip to the computer, not the printer. Do yourself a favour next time you are in downtown New Westminster. Stop by and have a coffee and a snack. You'll be back, I promise. New West lacks an excellent deli with great meats, cheese and breads; it also lacks a Deli with excellent well-priced sandwiches and great decor. This is the niche that Quantum Deli Bistro will fill. we can visualize a well-designed and well-managed organization that attracts customers equally for the quality of the food and the quality of the experience. 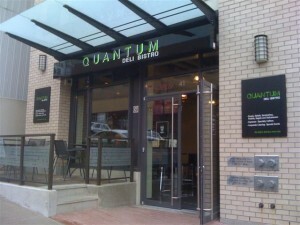 Quantum Deli Bistro will attract walk-by customers, yet its food, its interior, and the execution of its branding will also attract customers drawn to it as a destination. Ultimately, customers will speak well of the food, and, upon entering the space, will wonder if they have somehow been transported to a place more refined than the typical New West restaurant. I have to chime in and add my praise for Quantum. I am so happy to have this great new place to get fresh olives, delicious paninis, and a perfect cup of coffee. Love it! Unfortunately Quantum is no longer. I saw a for lease sign in the windows and there was a letter posted on the glass saying you should find a local business and support, so I am guessing business wasn't going too well. I loved this place and it always seemed busy around lunch time. Gonna miss my build your won sandwich and the smoothies.